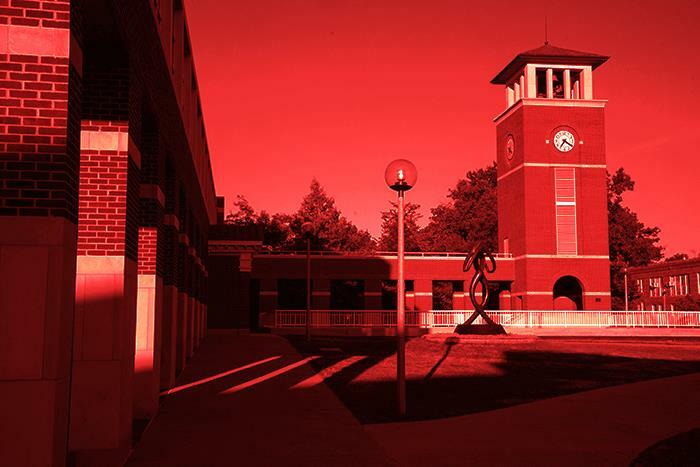 Truman will conduct a test of the emergency notification system at 10:15 a.m. Oct. 7. Students, faculty and staff who have signed up to receive Truman emergency alert text notifications will get a TruAlert text and email message letting them know it is a test. Those that have not signed up for emergency text messaging can do so through TruView. To sign up, sign in to TruView and click on the “Truman” tab. Click the “Update Emergency Text Messaging Information” under “Update and View My Personal Information” (lower right screen). A maximum of three phones can be registered to receive texts. Confirm information in the same manner. In addition to text and email messages, an emergency alert will be displayed on all Truman computer systems (Windows and Mac) where the Alertus software has been installed. This should include nearly all workstations on campus. 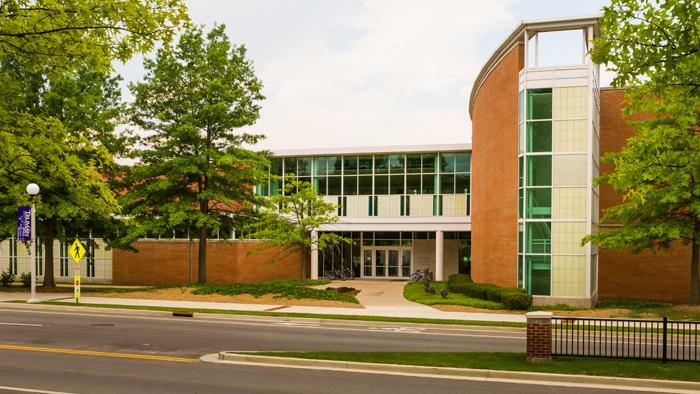 There will also be alerts sent to digital signs in Violette Hall, Magruder Hall, Ophelia Parrish and Health Sciences, to the Truman channel on the Cable TVs in residence halls, and to classrooms with the Truman touch-pad control system installed. The campus is also encouraged to review the emergency procedures. It is important that the entire community is familiar with these procedures in order to understand how to respond appropriately in a number of emergency situations. Several Truman alumni will be recognized at the Bulldog Forever Celebration Banquet at 6 p.m. Oct. 9 as part of Homecoming 2015. Justice began his teaching career in Des Moines, Iowa in 1971, where he coached football, track and field and cross-country for 12 years. After moving to League City, Texas, just outside of Houston, in 1983, he taught in the Goose Creek Consolidated Independent School District for 21 years. Following his retirement in May 2004 he continued to work part-time in the same school district for the next seven years. For 28 years, Justice worked as an official with the Drake Relays, returning to Des Moines, Iowa, every spring to help officiate the event. In 2012, he was inducted into the Drake Relays' Officials Wall of Honor. Since 1985 Justice has worked game operations at Rice University. He has also been involved with game management for Conference USA championships in baseball, football, track and volleyball. He was asked to help with the 2004 Super Bowl in Houston where he had the privilege of working with the sideline television camera crew as part of the security operations. Justice was a member of the Truman Alumni Board of Directors from 1997-2000, serving as president for the last two years. In 2001, President Jack Magruder appointed him Alumni Ambassador. Steve and his wife Katherine became charter fellows of the Joseph Baldwin Society and are members of the John R. Kirk Society and the President’s Circle. Crump, a Kirksville native, graduated from Truman and continued on to earn a master’s degree and Ph.D. from the University of Arkansas. 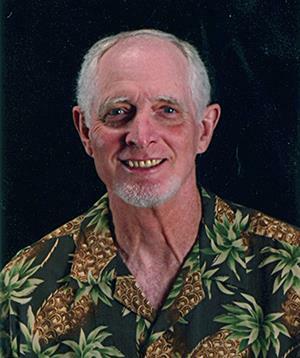 In 1969, he joined the Department of English at the University of Central Missouri in Warrensburg, and taught there until his retirement in 2011. Crump is the author of “The Novels of Wright Morris: a Critical Interpretation,” as well as a number of critical articles. During his career, he served on the editorial board of the D. H. Lawrence Review, edited several issues of the Publications of the Missouri Philological Association and was the fiction editor of Pleiades: A Journal of New Writing. Crump is also a partner in Cave Hollow Press, a small press devoted to publishing original fiction by Midwestern writers. As a faculty member at UCM, he served as chair of the Department of English and Philosophy, interim chair of the Department of Modern Languages, interim chair of the Department of Geography and Interdisciplinary Studies and associate provost. In 2014, the Service Award of College of Arts, Humanities and Social Sciences at UCM was re-named “The Gail B. Crump Meritorious Service Award” in his honor. Crump recently served six years on the Truman Foundation Board of Directors. He is a member of both the President’s Circle and the Truman Kansas City Alumni Chapter. After his time at Truman, Jason attended law school at the University of Missouri-Columbia where he was an editor of the Missouri Law Review. Now a senior associate with the law firm Blitz, Bardgett & Deutsch, L.C., in St. Louis, he focuses on complex commercial litigation. Previously, Jason served as a law clerk at the Missouri Court of Appeals, Eastern District. He was given his first break in the legal world as an intern for the Honorable Mary Rhodes Russell (’80). Jason was president of the St. Louis Chapter of the Alumni Association from 2010-2015 and has been a member on the Board of Directors of the Alumni Association since 2012. He also serves on the regional committee for the University’s capital campaign. From 2003 to 2015, Janeen worked in the curatorial department of the Saint Louis Art Museum, rising to the position of assistant curator of American Art. In 2015, she served as an onsite curator and contributing author for the multi-venue exhibition and related publication, “Navigating the West: George Caleb Bingham and the River.” The show recently concluded its run at the Metropolitan Museum of Art in New York. 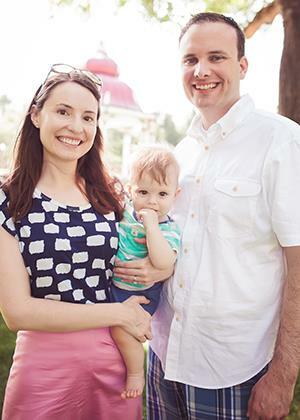 Jason and Janeen are members of the University’s Kirk Society and reside in St. Louis with their one-year-old son, Michael. Childers grew up on a farm near Rutledge, Mo., and for several years attended a one-room rural school. 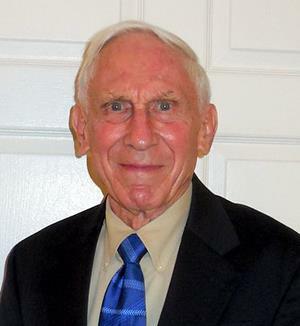 After graduating from Truman in 1955, he worked as an accountant and office manager in Kansas City, Kan., and New York City prior to entering graduate studies at Indiana University where he earned MBA and doctoral degrees. 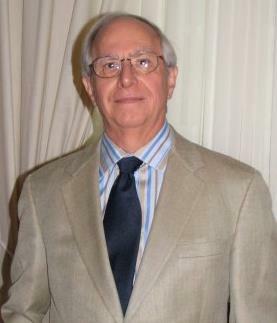 Victor and his family lived in Venezuela for a year while he carried out research for his dissertation. Upon joining the faculty of the Indiana University School of Business in Indianapolis in the fall of 1966, Childers had many unique opportunities abroad. He lived in Dacca, East Pakistan; Bangkok, Thailand; and Caracas, Venezuela, working on various assignments for IU. He also served on the faculty of the Semester at Sea Program for an around-the-world voyage and was given the opportunity to work in Maastricht, Netherlands, as well as Cairo. Childers has served as a member-at-large of the Truman Alumni Board and was honored in 2004 with an Alumni Distinguished Service Award. He is a member of the University’s President’s Circle. Vidyasagara came to Truman from Sri Lanka. As a student, he was president of the International Club and was a member of Student Senate. He was also a resident advisor in Missouri Hall and worked as a counselor for the Upward Bound program. 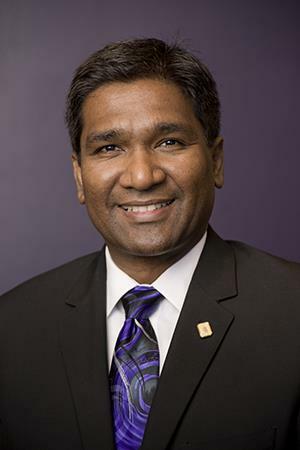 After receiving his bachelor’s degree in computer science, Vidyasagara went on to earn an MBA from the University of Illinois at Champaign-Urbana. Currently, he is a manager in information technology working for Honeywell Aerospace. The president of the Arizona Alumni Chapter, Vidyasagara and his wife, Pasanthi, whom he met while at Truman, reside in Phoenix. 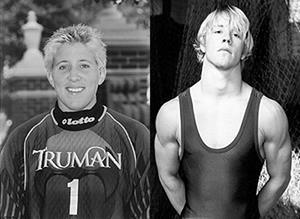 Two Bulldog national standouts, Emily Huyck, women’s soccer, and Merrick Meyer, wrestling, will join the Truman Athletics Hall of Fame as part of the 2015 Induction Class. This year, the Hall of Fame was split between two different weekends to allow soccer teams to be present for Huyck. A banquet took place Oct. 3 to celebrate Huyck’s induction. Meyer will be inducted as part of the Bulldog Forever Celebration Banquet at 6 p.m. Oct. 9. Huyck was a two-time Mid-America Intercollegiate Athletics Association Most Valuable Player and a three-time, first-team all-conference goalkeeper for the Bulldogs from 1998-2001. She set a school record of 43 shutouts and currently has the ninth longest shutout streak in Division II. She was 21-1 in the first three years of women’s soccer in the MIAA while the Bulldogs began a dynasty of winning seven straight league titles from 1999-2005. During her senior season in 2001, Huyck became the first keeper in Truman history to earn All-American honors as she garnered National Soccer Coaches Association of America second-team honors while leading the Bulldogs to an 18-3 record and the NCAA National Quarterfinals. Huyck is currently the director of the Montessori Co-op School in Omaha, Neb., and continues her involvement with soccer by coaching various ages at the club level and running her own introduction to soccer/skills camp for younger children. Meyer was the 141-pound NCAA Division II national champion in 2004, joining only Curd Alexander (1968) as Truman wrestlers to win individual titles. Meyer was a two-time All-American, in 2003 and 2004, a four-time national qualifier and owns the Bulldog all-time career wins record with 130. He averaged more than 32 wins a season with a high of 34 in 2005. Meyer’s college career record was 130-26 with more than half his victories resulting in bonus match points. He never lost a home match in Pershing Arena and placed in every college tournament in which he competed. After graduating Meyer joined The Boeing Company where he works in the International Business Finance Office. He returns to Truman every year with members of the Boeing team to talk about his college experience and recruit college graduates. More detailed biographies for the 2015 Homecoming honorees can be accessed below. The award for the Alumni Chapter of the Year will be announced at the banquet. More information on each of these awards, past recipients and how to nominate someone can be found at truman.edu/alumni-donors/awards-recognition/, or contact bulldogforever2@truman.edu. To purchase banquet tickets, visit the online Alumni Store. 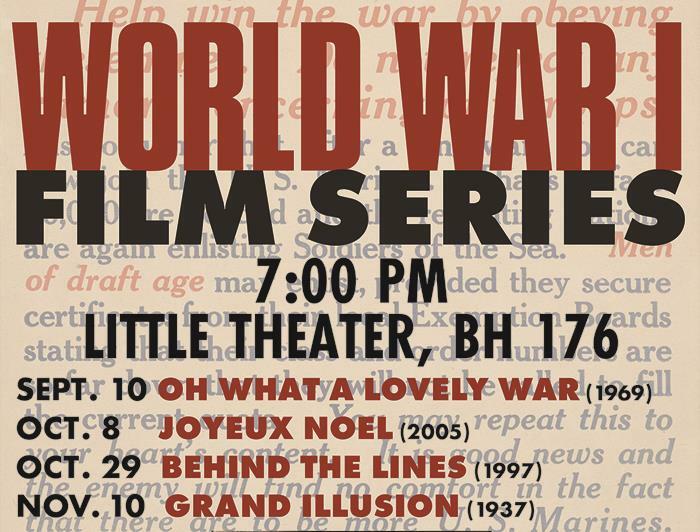 To help commemorate the centennial of World War I, the Truman History Department will host a viewing of "Joyeux Noel," the second picture in its World War I Film Series on 7 p.m., Oct. 8 in Baldwin Hall Little Theater. Released in 2005, it tells the incredible story of the 1914 “Christmas Truce” along the Western Front — a day when soldiers from both sides of the line put down their weapons to greet their enemy in “no man’s land.” This unauthorized truce remains one of the most extraordinary moments of the war. The film tells the story from the perspectives of both sides of the conflict. Truman’s disABILITY Awareness Day and Conference will take place Oct. 6 in the Student Union Building, and will feature keynote speaker Colleen Kelly Starkloff as well as a variety of breakout sessions. Starkloff co-founded the Starkloff Disability Institute with her husband, Max Starkloff, and has served as the co-director since his death in 2010. Together the couple also co-founded Paraquad in St. Louis in the 1970s. As vice president of Paraquad, Starkloff oversaw widespread education for issues related to independent living, developing new program initiatives and coordinating activities that promoted implementation of the Americans with Disabilities Act. She served two terms as the U.S. organizer of the Japan/USA Conference of Persons with Disabilities, and was also the founding chair of the Affordable Housing Commission in St. Louis. In this role, Starkloff initiated and organized the Universal Design Summits, which trains architects, designers and builders on the uses and benefits of Universal Design in home and community design. By establishing the Max Starkloff Speaker Series in 2011, she is able to educate the public on the need to create a world that welcomes all people with disabilities. Since 2013, Starkloff has been consulting and training on issues related to employment of people with disabilities in mainstream, competitive jobs. Having received several awards in the disability field, she often speaks on a variety of subjects related to disability rights. Starkloff will give her presentation over lunch, taking place from 11:50 a.m.-2:20 p.m. The lunch is free of charge. As part of the Global Issues Colloquiums, Starkloff will give another presentation later that day entitled, “Where in the World Are We Going with Disability Rights?” This event will take place at 7 p.m. in Violette Hall 1010 and is free of charge. The events of the conference will take place in the Student Union Building with the specific room location indicated below. The Student Activities Board will host a free performance by Cirque Zuma Zuma at 7 p.m. Oct. 8 in Baldwin Hall. Often described as an African-style Cirque du Soleil, Cirque Zuma Zuma packs every show with non-stop action and incredible features that keep audiences on the edges of their seats. The 20-person show includes performances of all different types of African culture, including human pyramids, balancing, tumbling, contortions, percussion, juggling and many more. For more information, contact Sarah Wilkins or Hannah Litwiller at specialevents.sab@gmail.com or 660.785.4722. Truman will use the entire month of October to raise awareness of its graduate programs and highlight some student successes. 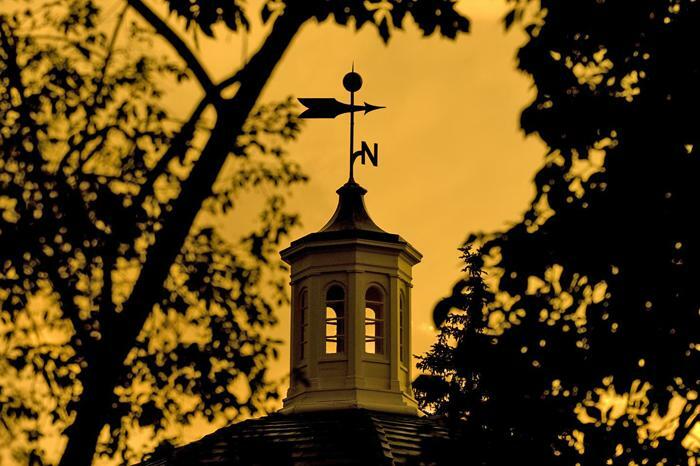 Fall coincides with the main graduate recruitment season. Truman offers master’s degrees in accountancy, communication disorders, English, leadership, music, education and biology. 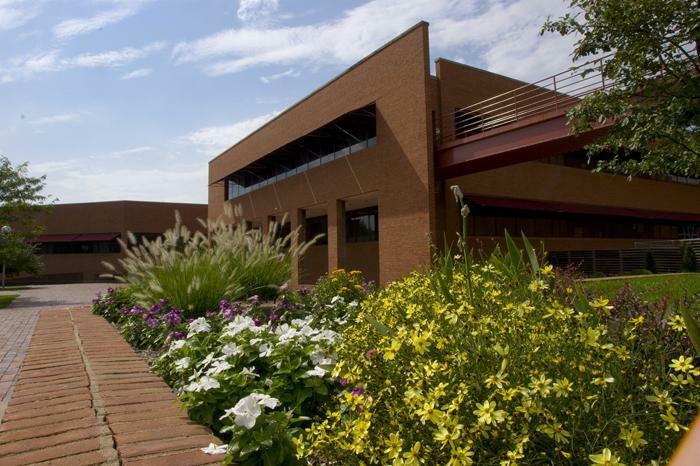 The University also offers graduate certificates in data science, as well as sustainability and environmental studies. Currently, graduate degree programs in Missouri are preparing more than 60,000 students for leadership in their fields. The state will celebrate Graduate Education Week, Oct. 12-16. Additionally, Truman will host a series of events throughout the month specific to its programs and students. Truman’s schedule of events will begin with “Journey Westward,” a concert featuring the Truman Wind Symphony, conducted in part by graduate students Christian Pierce and Lynnea Wooten. It will take place at 2 p.m. Oct. 4 in Baldwin Auditorium. Admission is free. The University Career Center will host an open house from 1-3 p.m. Oct. 13 in the Student Union Building 3100. Visitors can learn what jobs may be available to them as a future employee with a master’s degree. Alumnus Theodore Moore will perform at 3:15 p.m. Oct. 24 in Ophelia Parrish as part of the New Horizons Music Festival, which will have events occurring throughout the day. Truman graduate student poets, writers and songwriters will showcase their work at a prose/poetry slam from 6:30-8:30 p.m. Oct. 27 at the Aquadome, 120 S. Main Street in downtown Kirksville. For a complete listing of all Truman Graduate Education Month events, visit truman.edu/majors-programs/graduate-studies/graduate-education-month. More information about Truman’s graduate programs can be obtained by contacting the Office of Graduate Studies at 660.785.4109 or by emailing Stephanie Dunn at sdunn@truman.edu. The Student Health Center is offering flu vaccinations Oct. 7 and Oct. 14. Walk-in clinics will be available 3-5 p.m. Oct. 7, and 2:15-5 p.m. Oct. 14. This particular vaccination covers four strains of influenza. If the clinic times are not convenient, individual appointments may be scheduled. This is a reminder that influenza can be a serious disease that can affect students and faculty for several weeks at a time. It can be deadly for some individuals. 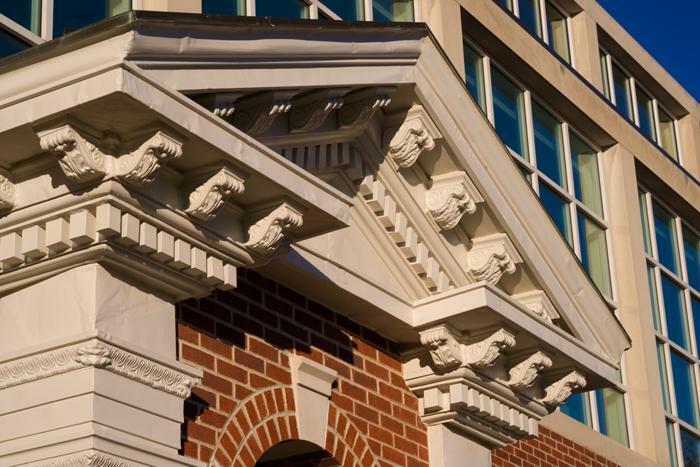 Those living in on-campus housing are at greater risk of exposure and illness. For more information, contact the Student Health Center at 660.785.4182. As part of the Global Issues Colloquium Series, Colleen Starkloff, co-founder of the Starkloff Institute, will present “Where in the World Are We Going with Disability Rights?” at 7 p.m. Oct. 7 in Violette Hall 1010. Starkloff helped secure passage of the Americans with Disabilities Act, and served two terms as the U.S. organizer of the Japan/USA conference on disabilities. Her colloquium on the United Nations Convention on the Rights of Persons with Disabilities is co-sponsored by Truman’s Disability Studies Program, whose disABILITY Conference she is keynoting earlier in the day. 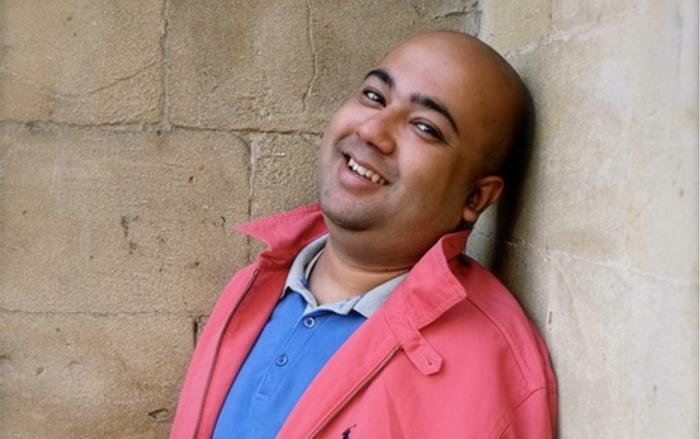 Fiction author and Truman alumnus Prajwal Parajuly ('06) will read from his work during a presentation at 7:30 p.m. Oct. 6 in Baldwin Hall Little Theater. The event is part of the Clayton B. Ofstad reading series sponsored by the Department of English and Linguistics. The son of an Indian father and a Nepalese mother, Parajuly’s writings have appeared in the New York Times, the Guardian, the New Statesman and on the BBC. “The Gurkha’s Daughter,” his debut collection of short stories, was shortlisted for the Dylan Thomas Prize in the U.K. and longlisted for The Story Prize in the U.S. “Land Where I Flee,” his first novel, was published in 2015 to international acclaim. Parajuly splits his time between London and New York. 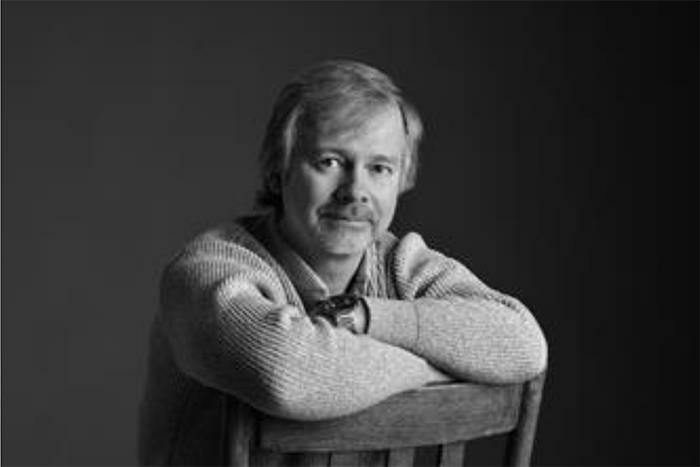 He is currently the Clayton B. Ofstad endowed writer-in-residence at Truman. 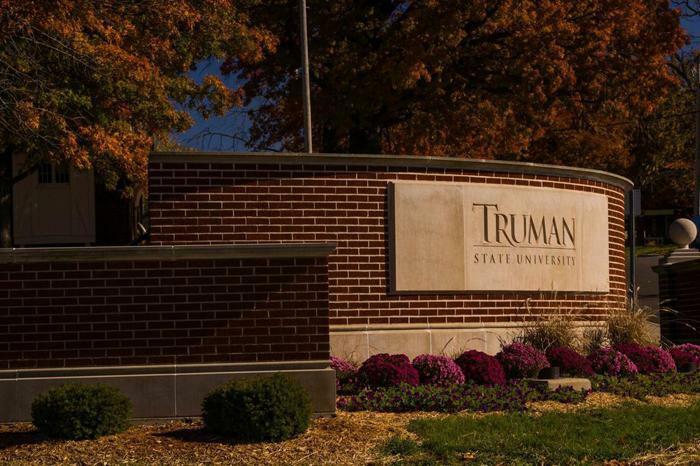 Truman’s Homecoming week will take place Oct. 4-10. Homecoming Activities will take place throughout the week on campus and all are invited to join in the festivities. Students not on an organizational team can create their own team, referred to as an individual team to compete in events during the week. Event sign-ups are online at homecoming.truman.edu. Teams will be challenged to complete a giant puzzle, for which the puzzle pieces will be obtained after the completion of a series of four smaller challenges. This event gives teams the opportunity to compete in a inflatable jousting tournament as well as individual game booths. Cheer on each team as they compete in a relay race competition. Watch team performances based around the homecoming theme of “Survivor” and be sure to purchase tickets ahead of time. This race will honor the memory of William Batterson who recently passed away. Watch the Homecoming 2015 Parade with organizations from Truman and Kirksville. Get pumped for the game and listen for an announcement of total philanthropy money raised. Apparel table sales will be setup throughout the week from 10 a.m.-2 p.m. in the Student Union or on the Mall. Apparel may also be purchased online. For more information about events, check out the Homecoming website at homecoming.truman.edu. Truman will celebrate Homecoming the week of Oct. 5-11. Due to the Homecoming tailgate, the large parking lot southwest of the intersection of Patterson and Franklin streets (north of Barnett Hall) will be closing at 10 p.m. Oct. 8. The Department of Public Safety asks all students who traditionally park in that lot to move their vehicles to another location by 10 p.m. Oct. 8. This parking lot will be closed Oct. 9 and Oct. 10 for Homecoming activities. In addition, the Truman parade will take place at 9 a.m. Oct. 10. All cars parked on Franklin Street will need to be moved to another location by the evening of Oct. 9. Cars not moved off of Franklin will be towed. Questions may be directed to the Department of Public Safety at 660.785.4176. The parking lots on the southwest corner of Patterson and Franklin streets will be open for all families, friends, alumni and students to tailgate before the game. Admission is free. For $6, attendees can pre-purchase a tailgate lunch. Meal tickets can be purchased online here. A limited number of meal tickets will be available at the tailgate and can be purchased with cash or check, but pre-registration is preferred. In case of inclement weather, the tailgate and other events will move to the Student Union Building. Adults of drinking age may bring in their own wine or beer. Event staff will be checking identification. Only wine and beer will be allowed and must be in cans or cups. No glass containers are permitted. Hard liquor and hard liquor products are prohibited. Kegs are not allowed. The complete homecoming tailgate policy is available here. Each fall, Truman alumni and friends come together for the Alumni Leaders Conference and Campaign Volunteer Training to share ideas, develop new skills and network with other Bulldogs. Attendees will learn effective ways of communicating, how to plan successful alumni events and gain insight to what is happening on campus. This year, the ALC will take place the morning of Oct. 9 of Homecoming. Sponsored by the Truman Alumni Association, the conference is free of charge and attendees will receive a special gift for participating. The conference will be bookended by complimentary meals of breakfast and lunch with the Truman Board of Governors, the Truman Foundation Board of Directors, the Truman Alumni Board of Directors and the President’s Advisory Council. Anyone interested in attending the ALC can email Denise Smith, director of alumni relations, at bulldogforever2@truman.edu. Erika Woehlk will be available Oct. 10 the morning of Homecoming for a book signing of her work, “Kirksville,” celebrating its one-year anniversary. The book showcases a pictorial history of Kirksville as well as several historic pictures of Truman’s campus. Woehlk will be stationed from 10 a.m.-12 p.m. just outside Truman’s Bookstore in the Student Union Building. Books will be available for purchase. 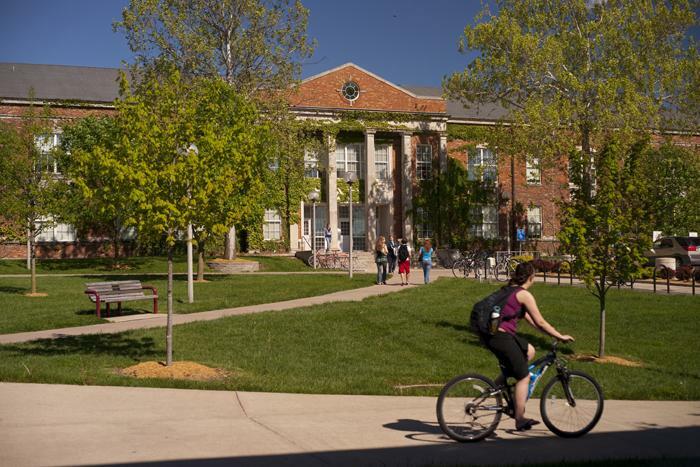 As part of Truman’s energy project, the air handlers in the west side of McClain Hall are scheduled to be replaced beginning Oct. 12. In order to allow completion of installation before the heating season is here, the removal of the existing air handlers will take about four weeks extending through Nov. 6. During that time, there will be no air conditioning or heating on the west side of the building. The event is free of charge and will take place from 6-8 p.m. in Baldwin Hall Little Theater. As part of the event, Truman alumni Jeremy and Rachel Mapp, current house parents at Joe’s Place, will facilitate a discussion about homelessness in youth. They will highlight the steps taken in the Maplewood Richmond Heights District of St. Louis to address this concern. For more information about the documentary, visit joesplacestl.org. For more information about the film series, contact Jeanne Harding, director of field experiences, at 660.785.4399 or by emailing jharding@truman.edu. Submissions for the conference must be received by Oct. 12. Papers should be eight-12 pages in any area of philosophy or religious studies and should also include a cover sheet with name, institution, title of paper, address, email and phone number. Presentations must be approximately 30 minutes, including time for questions. Papers may be submitted either as a hard copy or by email. If accepted, authors will provide a 100-word abstract by email. For more information or to submit a paper, contact David Murphy at dgmurphy@truman.edu or at the address below. The Multicultural Affairs Center is celebrating Indigenous People’s Day with a presentation by award-winning author John Smelcer. Smelcer’s presentation, “We Are The Words We Speak: Native American Languages and Identity Crisis,” will take place at 7:30 p.m. Oct. 12 in Violette Hall 1000. The presentation is free of charge. For more information, contact Jerad Green at jegreen@truman.edu. Thirteen Truman nursing students will present their unique experience abroad at 7 p.m. Oct. 13 in the Student Union Building Alumni Room. This past summer, May 15 to June 7, the senior-level nursing students journeyed half-way across the globe to the Philippines. Under the supervision of two nursing professors, Kit and Steve Hadwiger, the students participated in numerous nursing and cultural exposures, gaining clinical experience with patients and health care delivery from a transcultural perspective. The presentation will focus on the students’ hands-on experience in clinical work and cultural immersion in the Philippines. Specific presentation topics will include: geography, nursing education, family organization and roles, maternity care, STI policies, nursing scope and standards of practice and economic expenses in health care. A video will also be screened showing pictures from their travels. During the first week in Manila, the students participated in maternal and nursery care where they developed competencies in the assessment of birthing mothers and newborns and cross-cultural communication. Each student had the opportunity to assist in delivering a newborn baby. Students also had the opportunity to assist with patient care in units of their choice, including the major and minor operating room, neonatal intensive care unit, burn unit and emergency department. From Manila, they traveled south to Iloilo City where the students enrolled in the 16th Transcultural Nursing Program at West Visayas State University. Clinical experiences included home visits, a social hygiene clinic, a leprosarium, and hospital rotations in the medical, pediatric and surgical wards of WVSU medical center. Communication and cultural accommodation during clinical experiences were facilitated by nursing student buddies from WVSU. Nursing students who participated include: Shellie Brashears, Megan Doerhoff, Rachel Drury, Jacob Finke, Ellen Hargrove, Hannah Haywood, Tori Holt, Kristen Holwick, Kaylee McCune, Jaclyn Morris, Alyssa O’Brien, Lindsey Purcell and Kyle Sweeney. 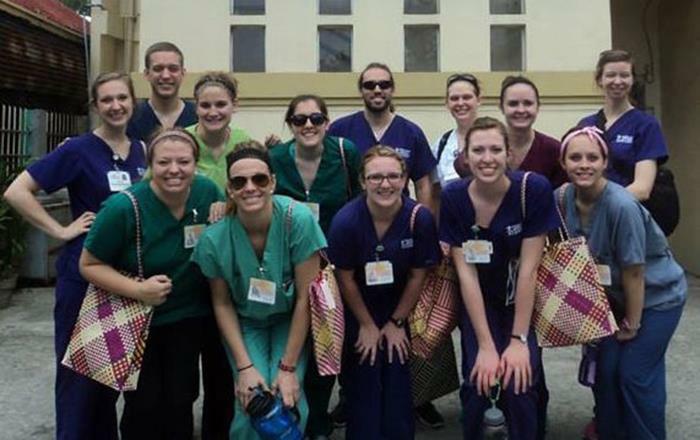 Nursing students stop for a picture while in the Philippines. Pictured, front row, left to right: Hannah Haywood, Jaclyn Morris, Alyssa O’Brien, Megan Doerhoff and Shellie Brashears. Pictured back row, left to right: Kristen Holwick, Jacob Finke, Rachel Drury, Tori Holt, Kyle Sweeney, Kaylee McCune, Ellen Hargrove and Lindsey Purcell. 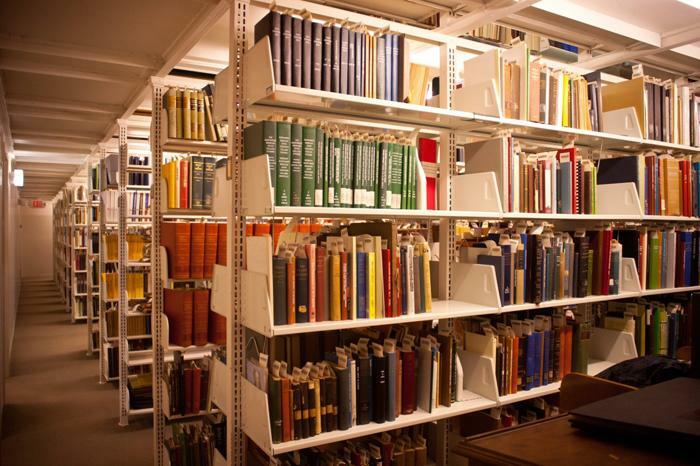 A workshop on electronic records management for small historical institutions and records repositories is being offered from 10 a.m.-3 p.m. Oct. 16 in Pickler Memorial Library. The workshop is sponsored under the State and National Archival Partnership Grant awarded to the Office of Missouri Secretary of State Jason Kander and the Missouri State Archives, and was given by the National Historical Publications and Records Commission. Intended for staff and volunteers of Missouri’s smaller record repositories, topics covered in the workshop included: appraisal, accessioning and description of electronic records; issues surrounding electronic records management; lifecycle of electronic records; preservation strategies; and understanding the importance of long-term access. The workshop will be lead by Missouri state archives staff. There are 25 spots available and registration is based on a first-come first-serve basis. To register, contact Brian Rogers at brian.rogers@sos.mo.gov or 573.526.1981. This fall, Janice Clark’s HLTH 366 class is hosting a “Shades for Shade” fundraiser to help Faith Lutheran School buy a protective shade covering for their students. Visit the “Shades for Shade” table from 1-4 p.m. Oct. 13 and 14 in the Student Union Building to pick up a free pair of sunglasses and give a donation to help the cause. A shade structure can greatly reduce direct UV radiation contributing to a decrease in risk of skin cancer in the children and staff at Faith Lutheran. Join in bettering the health of the children in the community and show Kirksville pride with a new pair of shades. Gregg Hammann, chief operating officer of Sedgwick, Inc. and former president and CEO of Nautilus, Inc., will present “Failure that Creates Growth.” Hamman is the current Bentele/Mallinckrodt Executive in Residence and his presentation will take place at 3:30 p.m. Oct. 19 in Violette Hall 1000. Richard-Gabriel Rummonds, acknowledged master of the cast iron handpress, will present “Creating Great Literature in Limited Editions on Iron Handpresses: Borges, Cavafy, Burgess, Calvino, Cheever, Gioia,” at 7:30 p.m. Oct. 20 in Baldwin Hall Little Theater. The lecture is sponsored by the Department of English and Linguistics and the Department of Classical and Modern Languages. The Missouri Conservation Department will conduct an archery workshop and will be teaching students how to shoot properly. Those who register by Oct. 21 will receive a $5 credit to be used in the Mainstreet Market after the workshop on Oct. 25. This event is sponsored by the Student Wellness Initiative. Listed below is a description of the volunteer and donation opportunities available during Truman's 2015 Big Week of Giving. The dorm floor that donates the most food during this week will receive an ice cream party for all the winning floor’s residents. Student’s book fines will be waived in exchange for canned food donations (1 can = $1). Students will be given the opportunity to divide off into groups and go door-to-door to “trick-or-treat” for food and monetary donations. Each team will each be assigned to a certain number of streets. Interested volunteers should contact the SERVE Center at trumanserve@gmail.com. Students will be stationed outside of Hy-Vee and Walmart to collect food and monetary donations. All donations will go directly to the Food Bank for Central and Northeast Missouri. Anyone unable donate at the events listed above and would still like to contribute, can stop by the SERVE Center from 10 a.m.-3 p.m. Oct. 26-30. To show appreciation to community partners during the Big Week of Giving, the SERVE Center, the Center for Student Involvement, and Student Affairs will sponsor a luncheon at 12 p.m. Oct 27. The Community Partner of the Year Award will be presented at the luncheon and all of the nominees will be recognized for their contribution to the Kirksville community. The deadline to nominate community partners is Oct. 20. Nominations can be made online here. This event brings together community partners and campus faculty, staff, and student leaders in recognition of the outstanding community agencies that partner with Truman for service and service-learning projects. At the luncheon, there will be discussions about the direction of future public scholarship endeavors and the identification of critical community needs. 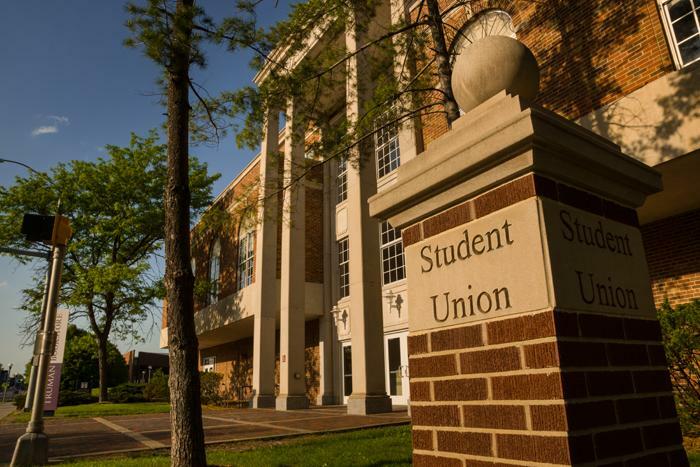 The University Board of Governors will meet at 1 p.m. Oct. 9 in the Student Union Building Conference Room. France is home to many of Truman’s bilateral exchange programs. Angers, France hosts École Supérieure des Sciences Commercials d’Angers or ESSCA, an institution that offers many business courses and advanced French electives. The program allows students to pay Truman tuition while studying abroad. For more information, or questions about the program, contact the Study Abroad Office at ciea@truman.edu or visit ESSCA’s website. The Wiesbaden Business School is offering an international exchange program for students to study abroad in Weisbaden, Germany. The program provides a variety of courses with all classes being taught in English. This opportunity is a bilateral exchange allowing students to pay Truman tuition while studying abroad. For more information, or questions about the program, contact the Study Abroad Office at ciea@truman.edu or visit Wiesbaden’s website. Curtis Blakely, associate professor of justice systems, and Michelle Blakely, student education and support coordinator, have just released their book entitled, “Socio-Physics: Applying the Natural Sciences to Criminal Justice and Penology.” It embodies Truman’s vision of promoting creative, innovative and progressive thinking within an interdisciplinary context. Efforts are brought to bear on current correctional processes through the lens of a liberal arts perspective. Overcrowding, budgetary deficits and skyrocketing recidivism rates place the prison at the forefront of national concern. Compounding these problems is a lack of ingenuity among our nation’s leaders about how to deal with these issues. The authors’ approach, referred to as socio-physics, provides a unique analysis of these challenges with the ultimate goals being offender rehabilitation and decreasing crime rates. By using an interdisciplinary perspective, the authors provide a firm foundation upon which new conceptual and theoretical models can be built. The ramifications for this work are far-reaching and are relevant to the understanding and improvement of most public service agencies. This book represents the first known effort to apply the natural sciences to the study of human behavior within a correctional context. Vayujeet Gokhale, assistant professor of physics, recently secured a two-year NASA EPSCor grant for a total of $59,200. It will be used for student stipends and outreach, as well as materials and supplies. W. Lee Powell Jr. from the University of Nebraska at Kearney was the co-principal investigator. Amber Johnson, professor of anthropology, presented a paper titled “Exploring Ecological and Evolutionary Process Using Binford’s Hunter-gatherer Data” in an electronic session on the synthesis of biology, ecology and ethnographic data within a global electronic symposium called Complex Systems-Digital Campus on Oct. 1. She was also co-author of a paper with Mark Moritz and Elizabeth Gardiner of Ohio State University in the same session titled “Comparative Study of Pastoral Tenure Systems.” Truman alumnus, Dr. Jacob Freeman, assistant professor of anthropology at Utah State University, also presented at the conference; Truman alumnus Rudolf Cesaretti (Ph.D. student at Arizona State University) served as the session moderator. Huping Ling, professor of history and Changjiang Scholar Chair Professor of the Chinese Ministry of education, has been selected as a Visiting Research Fellow of the Hoover Institution at Stanford University from Jan. 1 to Dec. 31 in 2016. The Hoover Institution offered the fellowship to assist Ling’s research at the Hoover Institution of Libraries and Archives regarding her research project “Sward Blue: A Chiang-Kai-shek’s Man,” according to the appointment letter from the Hoover Institution. Ling’s research aspires to explore the currently under-explored areas of the Nationalist history in China from the 1930s to 1949, utilizing the newly unclassified records of Diaries of Chiang Kai-shek, T. V. Soong Papers, Kuomintang Project at the Hoover Institution Archives. The deadline to submit an application for the Benjamin A. Gilman Scholarship is Oct. 6. Click here to fill out the application to have the opportunity to receive funding and to become a member of the study abroad community. BransonShowTickets.com is offering a $1,000 scholarship to assist in furthering the education for young people. The essay topic for their annual scholarship is “How (Enter the Show) Inspired Me to Realize My Dreams.” In the event that students have not seen a Branson Show, they are invited to research and use their creativity. At the end of the essay, students may include a short personal statement if preferred, but it is not a requirement. To find out more about this scholarship, visit bransonshowtickets.com/company/scholarship. Deadline for essay submission is Oct 15. The Coca-Cola Scholars Program Scholarship is an achievement-based scholarship awarded to graduating high school seniors each year. Students are recognized for their capacity to lead and serve, and their commitment to making a significant impact on their schools and communities. With the 27th class in 2015, the foundation has provided more than 5,550 Coca-Cola scholars with more than $56 million in educational support. One-hundred and fifty Coca-Cola Scholars are selected each year to receive this $20,000 scholarship. Applications can be completed by clicking here and the deadline to apply is Oct. 31.